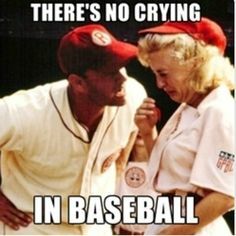 There is no crying in T-ball. For the most part, I do happen to function normally. But every once in a while, I take leave of my senses. It’s like a vacation. I know, right? NUTBALL. Just like that, BOOM. My senses just up and left the building. It started out ok. We have a team of ten five-year-olds, and their cuteness kinda makes me stop every once in a while, put my hands on my knees, and take a breath. Also, I am completely out of shape, so there’s that. It’s a good thing they’re cute. Because y’all, they are no Lorenzo Cain. Ok, but the truth of it is, the kids have heart. They are all Bad News Bears and totally into the hustle and the love of the game. One kid who looks EXACTLY like Charlie Brown hit the ball, fielded it himself, and then proceeded to slide into home base (completely foregoing those pesky second and third bases because who needs ’em?) with straight-up flair. We are not short on heart. We are, however, a bit short on stellar coaching skills. When I first informed the husband about this, he, of course, was all, “Yes! Sure! Let’s coach T-ball! Great idea!” Have I mentioned, he’s a golden retriever husband? Everything in his life engenders tail wagging and a lot of happy panting. That sounded rather saucy. Anyhow. It’s not that kinda blog. So, I threw the ball at the husband, and he gleefully galloped out and retrieved it, all thrilled with life. We’re gonna coach T-ball! This will be a blast! Family time! Togetherness! And then, he left me. He left the togetherness. And our team. He left us. The husband left us to do this nutball thing called Bike Across Kansas. It’s when a bunch of people get together and ride their bikes across Kansas. If you wanna read about adventures with this last year, click here. I kinda think all this is crazy, but hey, he wasn’t the one to volunteer us to coach T-ball. I did hope that maybe this year they would bike across the upper eastern corner of Kansas because, if you know your geography… making it across our state wasn’t gonna end anytime soon. So he’s… in Kansas. On a bike. For a while. And lo, I am now the coach of T-ball. All by myself. This is the part of the blog where you need to cue the scary music in your head. You know the movie, Jaws? You remember at the beginning where all those inebriated tan kids are sitting around the campfire, and it’s all so mellow and kinda… groovy? And then, WHAMMO, that poor blonde girl becomes a shish kebab for Jaws and the movie kinda takes a difficult turn? Well, that’s how it was at our last T-ball practice. Except there was no skinny dipping or bad 70’s hair or, well, a gigantic man-eating shark. But other than that, it was the SAME. I mean it! Started out just fine. We did some stretching… did a few jumping jacks (which is hilarious, by the way. Five year olds often look like jack rabbits on crack when they do these), and then we ran bases. We even ran them in the correct order! It was awesome! We were a well-oiled machine, people. Poetry in motion. 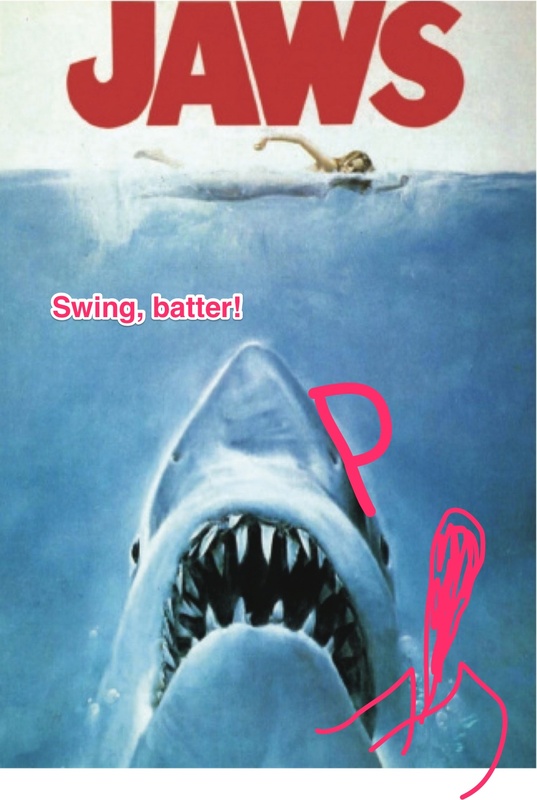 It was all very The Natural home run scene, I tell you. Until I decided to actually get balls into play. You see, up until then we had been using imaginary balls. Imaginary bats. It was PERFECTION. As we all know, real balls do cause trouble. And again, I know it’s not that kinda blog. So – I put a ball on the T… and stepped back, and then watched as all of my five-year olds lost their little minds. Bases were stolen. No, I mean LITERALLY stolen. Balls were fought over. One kid had a solid hit to center field that no one really saw at all. No one. Not one of them. AS IT FLEW OVER THEIR HEADS THEY DID NOT SEE IT. Some of the kids totally shut down and just started picking flowers. There’s a lot of flowers in the outfield, so it was really quite absorbing. I too considered picking flowers in the outfield. In case you didn’t know, “Picking flowers in the outfield,” is grown-up code for “Taking leave of my senses.” Which, neatly and oh-so English teachery takes us back to the introduction of this post! Wow! Full circle! Perhaps I haven’t lost my mind after all! Our first game is tonight. Stay tuned.